Shiitake mushrooms have been used in Asian cuisine for centuries, and today they are beloved worldwide as a somewhat expensive delicacy. Chinese and Japanese medical practitioners have always touted the immune-boosting capacity of shiitake. Ancient Ayurveda did not consider mushrooms to be food, since they classified fungi as tamasic, a quality that dulls the mind. Mushrooms, by the way, are also said to increase vata. Yet some mushrooms have been used medicinally in Ayurveda for thousands of years. Today, with much medical research demonstrating the healing power of shiitake mushrooms, many modern Ayurvedic practitioners recommend shiitake. If you have doubts about their suitability but you love mushrooms, I suggest that you see how you feel after eating them. You will know best whether or not they support your well-being. 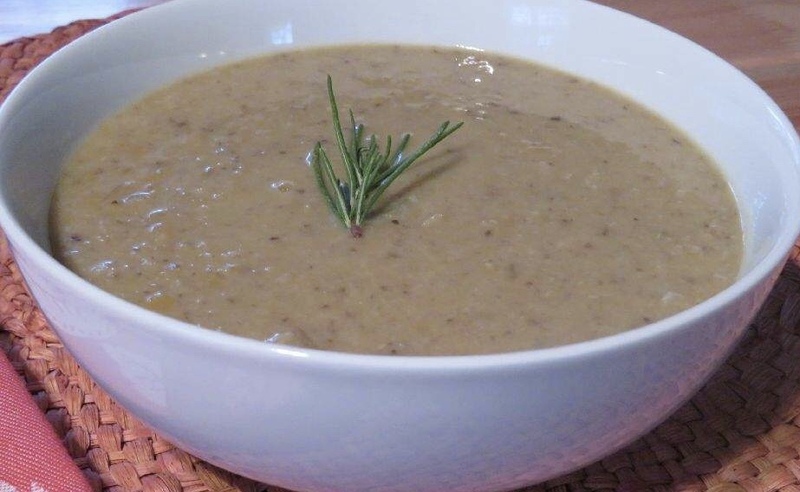 During these cold winter days, enjoy this Mushroom Lentil Soup as a main course or side dish, and boost your immunity to the nasty viruses that are wreaking havoc this time of year! Cook’s Tip: If you don’t have fresh soup stock, just use water and add ½ teaspoon of ground turmeric when you add the cumin and coriander. You’ll also want to add more salt, as well. 1. Heat ghee or oil in a 3-quart or larger soup pot on medium heat, and add the shallots. Stir the shallots frequently, and let them cook until they start to lightly brown. Then add the cumin and coriander, and stir. 2. While the shallots are browning, wash the mushrooms and remove and set aside their stems (which can be saved for stock). Mince the caps in a food processor or by hand. Add the mushrooms and the optional wine, if you wish, to the pot. Let the mushrooms cook for 5 minutes or until the wine reduces completely. 3. Add the stock and lentils, and bring the pot to a boil. Reduce the heat to medium, and add the bay leaf, sage, and rosemary. Cover the pot and let the lentils cook for 20 minutes or until they become completely soft and mushy. 4. Finish the soup with almond milk (fresh, if possible), ginger, and salt. Remove the sage and rosemary for a more delicate flavor, and if you wish, purée the soup with a handheld immersion blender. For a special occasion, you may wish to use ½ cup of cream or coconut cream instead of almond milk. Add a pinch or two of asafetida and 1 to 2 cloves of garlic to aid digestion, if you wish. Lovely post, Lisa! This looks delicious!! I made this for dinner guests and it got rave reviews! Lots of, “mmmm, this is soooo good!” comments. You made me look like a gourmet cook! Delighted to hear! Thanks for the feedback!